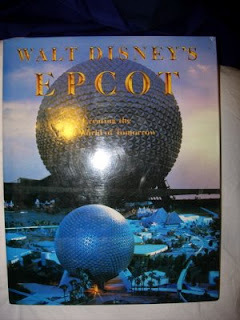 This book is entitled, "Walt Disney's EPCOT - Creating The World of Tomorrow". This book was published in 1982, which is the year that EPCOT opened at Walt Disney World in Florida. EPCOT stands for Experimental Prototype Community Of Tomorrow, and was conceived by Walt Disney to be a real city, where leading companies from around the world could preview and showcase new technology before rolling it out to the world at large. Walt had a lot of ideas for EPCOT. Unfortunately, he died before any construction could begin on Walt Disney World. EPCOT would open 11 years after the Magic Kingdom opened at Walt Disney World. Although it is not the city that Walt had in mind, the Walt Disney Company did use several key ideas in planning what became Disney's second theme park in Florida. EPCOT is divided into 2 sections- Future World, and the World Showcase. In Future World, we see science and technology in action. Here, guests experience technology, both modern and future. At the World Showcase, you experience pavillions representative of several countries from around the world- Mexico, Norway, China, Germany, Italy, Japan, Morocco, France, the United Kingdom, and Canada. Some of the pavillions feature rides or attractions; all of them feature shops, as well as restaurants. This book is about the building of EPCOT. It has several photographs, and shows artwork that was used in the original attractions that opened there. It shows all of the pavillions at EPCOT being built, as well as construction of attractions, like the World of Motion and Spaceship Earth. I like this book very much, particularly because I really love EPCOT- it is my favorite Disney park! This book, if you really want it, can be bought here for $127.00, which includes shipping, handling, and insurance (for shipping to the U.S. only, please).